All official training activities are logged with the BSA™ and can be accessed from the My Scouting™ website. If you have the necessary access rights you may be able to download a CSV file containing your troop's training history and use it to populate the training data in your TroopWebHost database. To download the file, go to https://my.scouting.org and logon using your BSA user name and password. Click on the Menu link to reveal the main menu, as shown below. 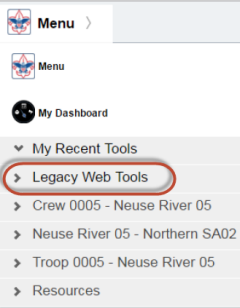 Select Legacy Web Tools from this menu to open the Legacy Web Tools menu, as shown at right. You may need to be a "Key 3" or "Key 3 Delegate" to access this menu item. If you do not have the necessary access rights for this function on the My Scouting site you may need to contact your District Executive to obtain a copy of the file. Note that you can only use this function with Internet Explorer version 11 or with FireFox. It will not work with Chrome or with earlier versions of Internet Explorer. Select Unit Training Tracking (IE v11 only) from this menu. The system will then display the Unit Training Tracking Report page, as shown below. Notice the drop-down list that says Select a format. Select CSV from this list, and then click the Export link directly to the right of that control. This will create a CSV file that you can save to your local disk. Do not open this file with Excel! Use the Save As option to save it directly to your local disk. Before you upload the file, we recommend that you update the BSA Membership IDs for all of your troop members, or at least the ones who have completed one or more training courses. The easiest way to do this is with the Update All...Adult BSA ID function. There is a similar function for scouts. Select Upload Training From MyScouting from the Training submenu on the Membership menu to see the page shown at right. Select the file that you downloaded from the MyScouting site using the Upload File control. We recommend that you always do a trial run the first time you upload each file. This will allow you to see the effect of the upload without actually updating your database. You may then want to make some changes to your data before you upload the file for real - which you do by leaving the Trial Run box unchecked. The system will try to find each training course that is referenced in the file in the training courses table. It will match on Course Code or Training Name. If it cannot find a match, it will not be able to load that training record...unless you check the box Add training course if not found? That option will cause the system to add new training courses to your list of available courses when they are found in the file. Press the Upload Training File button when you are ready to process the file.